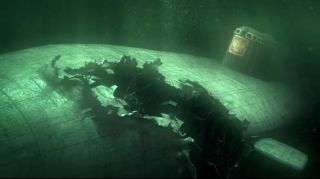 The Kursk was a nuclear-powered Russian submarine that was lost with all hands in the year 2000 as the result of an explosion caused by a faulty training torpedo. That disaster will be the setting for a first-person survival-adventure game by the same name, announced today by developer Jujubee. Little has been revealed about the game beyond the teaser, but the studio said the game will look at the tragedy "from a new angle," and be built around a "carefully-crafted story." Given the many questions surrounding the loss of the sub and crew, and the delays in rescue and recovery efforts, it's certainly fertile ground for fictionalization—if rather grim given the recentness of the tragedy. "Kursk will definitely be a game for mature audiences looking for a unique and cinematic experience," Jujubee CEO Michal Stepien said. "There is still controversy surrounding the real fate of this Russian submarine and with our game we hope to raise and answer some questions". No release target has been announced, but a website is up at Kurskthegame.com.